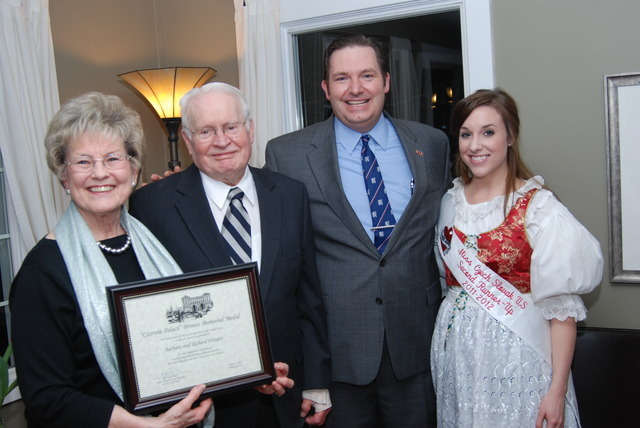 Richard and Barbara Winder, residents of South Jordan, Utah, have just become the first Utahns to receive the Czernin Palace Award. This highly prestigious award is given by the Czech Republic to a person or group that has contributed significantly to positive relations between the United States and the Czech Republic, and after more than 50 years of interaction with the Czech Republic, the Winders received the award in recognition of their efforts. The Winders enjoyed a special ceremony to receive the award at the home of their friend, James McConkie, on February 20. Finally, a year after the communist government was officially ended, the First Presidency called the Winders to reestablish the Church in the country and reopen the Czechoslovakia Prague Mission. After so many years of being cut off from direction from Salt Lake City, members of the Church were not easy to find. “When the Winders returned in 1990, they were able to locate roughly 150-200 members remaining from 40 years of communism. There had been a couple of baptisms, but roughly they started with 200 people,” said Tichy. The Winders had their work cut out for them, not only because of the shortage of active members, but also because of the predominant atheistic beliefs of the country. A poll conducted by the United States in 2001 showed that 52 percent of the Czech population identified as atheist, and current polls on atheism frequently show the Czech Republic as one of the most atheistic countries in the world.